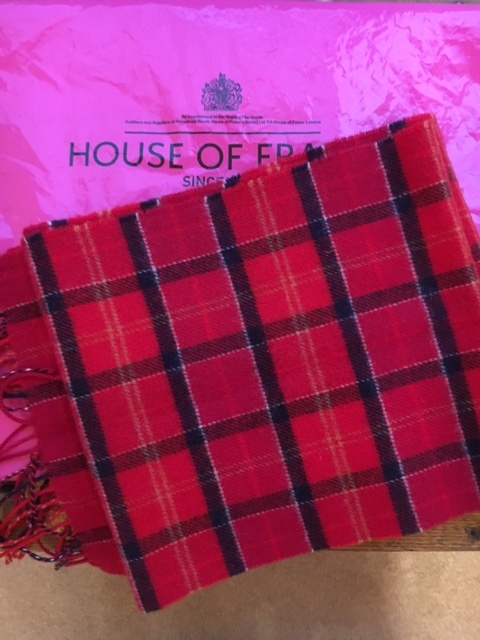 My friends returned from visiting their daughter and family in England and brought me a beautiful Barbour tartan lambswool scarf from House of Fraser. The scarf is 10 by 68 inches. Wearing your scarf, just the right way, will not only make a fashion statement, but may also provide greater warmth and protection from the elements. A wool scarf will be warmer than a synthetic. When it is really cold, wrap the scarf around the lower half of your head. Wrapping it over your nose and mouth will increase the temperature of the air you breathe making the cold less harsh on your lungs. Those of you living in the frigid temperature regions, wrap your neck up and be cozy warm. Those of us in the warmer winter areas, make that scarf a fashion statement.